The Yamaha CP-80 is an electro-acoustic grand piano. It was a very popular stage piano at the time (1976-1985) with a unique sound and with an authentic grand piano action. It was marketed by Yamaha as a touring friendly and electronically amplified variant of a grand piano. 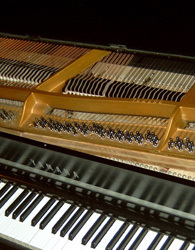 It was famous for its rock solid quality and considered by many as the "Rolls Royce" of the electro-acoustic pianos. The model was discontinued when the third generation of much smaller and lighter digital sampled pianos entered the market. Being electro-acoustic means that the instrument belongs to the second piano generation, having a real keyboard action with strings but without soundboard. Instead, the sound is generated through a sophisticated piezo type pick-up system that translates the vibrating strings into electric signals. The advantage is that the sound thus has an effective electronic amplification which is very useful for touring purpose. Another advantage compared to acoustic grand pianos is the weight and the size - although 3 musicians have to carry it, it is just half the weight compared to a baby grand and is easier to transport thanks to built in handles. CP-80 has a full range of 88 keys (73 keys on the sister model CP-70). It has single strings from the lowest note up to F#1 (midi number 42), and double strings for the other notes. One can clearly hear the change of timbre between F#1 (single string) and G1 (double string). The CP-80 has a warm and smooth sustain and its electronic character makes it suitable for jazz, pop and rock music. 2) "CP-80 restored" which is an attempt to provide a "virtual restoration" of the instrument, renewing particularly the wound strings which lacked the brilliance of brand new strings.